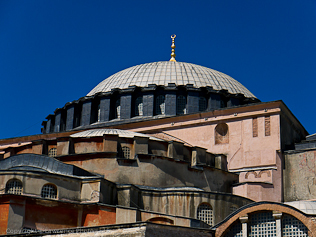 These are images from Istanbul the romantic city of Turkey, where the east meets the west. The Blue Mosque, the Galata Bridge, the Great Bazaar and other great sites, make Istanbul a wonderful place to visit. Stay in the centre of the triangle of the old city (Galata Bridge to the Suleymaniye Mosque to the Blue Mosque) and all the great sites are within easy walking distance. Running through the centre is a tram and underground travel system for easy access - in and out with the city. Istanbul boasts the finest mosques in the world and well worth a visit - the massive interiors and the colours are magnificent. Towering above the Bosphorus (which is also known as the Istanbul Strait) is the Galata Tower which has a lift to the top for splendid views of Istanbul. It can be reached by crossing the Galata Bridge from the old city, then using the small ‘cable’ railway tram system to the top of the hill and a short walk down part of the hill to reach the tower.